Aloha! I had a wonderful time participating in the ornament exchange this year. After getting to know Therese, I learned that her favorite colors were in the olive/lichen/moss range as well as the pink-red tones. In addition, she makes her own cabs. I also found out that she loves stars, bunnies and collects Santa’s from around the world. 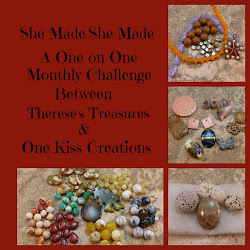 I had so many ideas on what to make for Therese! At first, I wanted to do a Bunny sitting on a base with candy cane poles. But, after making the bunny out of Swarovski crystal, I realized it would be too heavy. Plus, I wasn’t sure how “personalized” that was. So, on to plan 2. 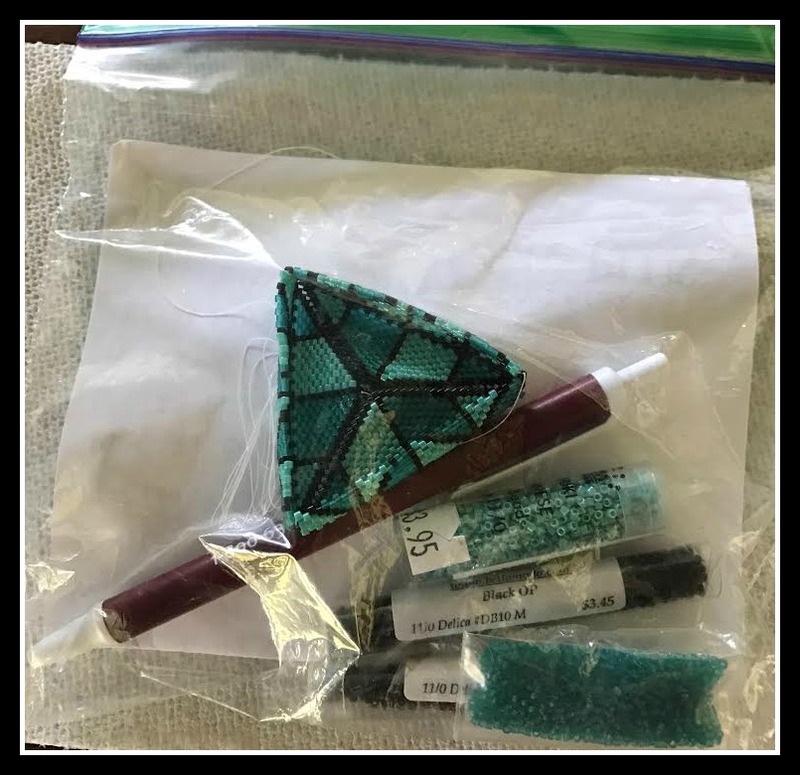 Given her color choices and love of gemstones – I remembered that I had made a colorway kit a while back that was perfect – the colors of tourmaline. And it was even better since the lichen/olive green is my favorite as well (Toho 2600). 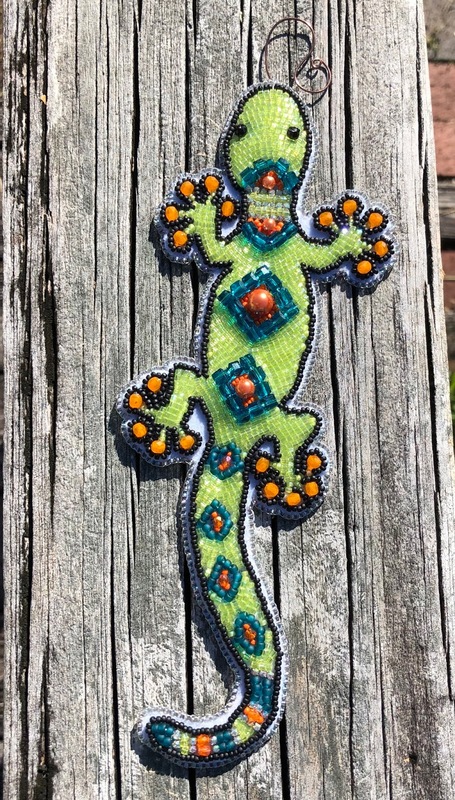 It would work both as a gemstone connection as well as combine all her favorite colors. So, I just started beading, not really having a plan. After a bit, I realized that it was going to come together as a snowflake/star shape which is one of her favorite shapes. Things progressed from there. And, I am showing a picture showing all the threads at the end that all have to be tied off, we’ve all been there, the least favorite and most time-consuming part of the project. 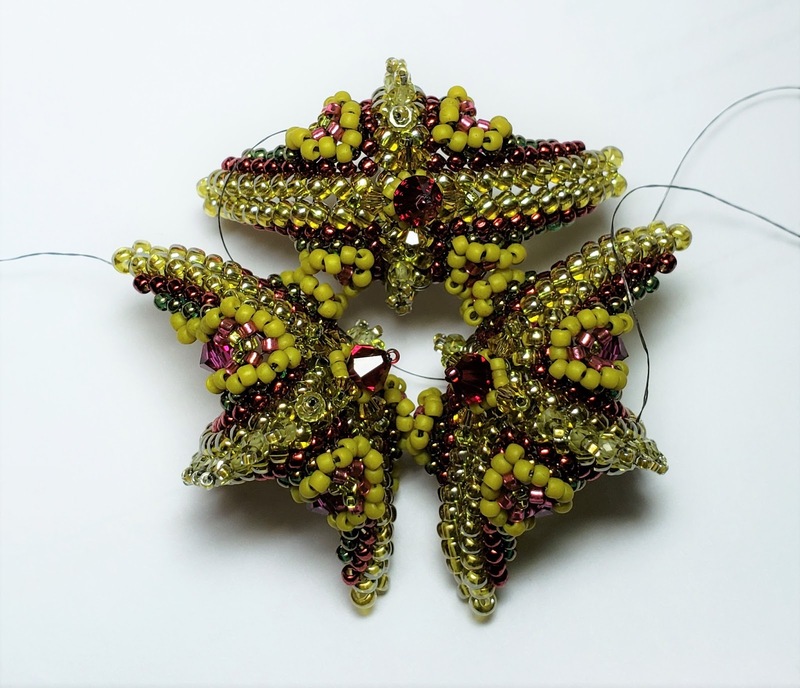 In all, I used seed beads, fresh water pearls, Swarovski crystal, and cubic zirconia. I also sent her the bunny to use as another ornament or just a figurine – it was just too cute. Of course, I forgot to take a picture of it before I sent the package. And, since Santa’s are her other favorite, I found her a “local” Hawaiian Santa ornament. I wish Therese and all of you a very Mele Kalikimaka and a Hau’oli Makahiki Hou. The pictures are shown in order of the ornament developing – they can speak for themselves. The start of it all! Well my package from Carrie Johnson arrived on Monday as promised and I opened it as soon as I got home from Tuscaloosa, AL on Wednesday. All I can say is OMG!!!! Carrie was so right when she told me that it will be worth the wait. So without further ado let me show and tell about what Carrie sent. When I opened the box I was like a small child looking at all the wonderful wrapped packages, so I just reached in a took out a package and unwrapped it. It was a kit for a felted bunny rabbit with the instructions in Japanese but I can follow the pictures, thank goodness I took a class in needle felting. Then I opened a package that had the cutest bunny that was beaded in RAW with Swarovski crystals, I squealed so load it scared my Mom she asked what was wrong so I showed her the bunny, she said that it was very pretty, but still did not understand my excitement. Maybe y,all to are wondering why I was so excited about the bunny, I collect rabbits in all mediums I also collect Santas. I then opened a box with a hand painted Hawaiian Santa in a hula skirt, Love it! I then picked a box that said to open last so I set it aside. Ok I wont keep going on about what all was in the box I will let the picture tell the story. Carrie sent one of her earring kits, beach glass and coral that she collected from a beach in Oahu, some Swarovski crystals, Tibetan trading beads and a turquoise cab, lamp worked beads one of which is a bunny, tea and coffee and chocolate covered Macadamia nuts, and a beautiful Hawaiian Christmas card. Okay on to the box marked to open last. It contained the exchanged ornament I was absolutely blown away with what I saw when I opened the box. Carrie you truly out did yourself with the ornament. I love, love, love it!!!!! This is the picture Carrie sent to me it is so beautiful I am still trying to wrap my brain around how she put this one together. I recognize the stitch Carrie used, it is Cellini spiral. It is also done in my favorite colors. Here it is on my tree. Here is the crystal bunny on my tree. Here is Hula Santa on my tree. My tree with all my handmade ornaments collected over the years some I made but most are from ornament exchanges I was involved in. Also on the tree are my Santa ornaments that I collected and that were gifted to me. Around the tree are some of my Santas that have been collected over the last ten years and on the fireplace mantle is my prized porcelain Santa in his sleigh and reindeer. I wish all a very Merry Christmas and a Happy New Year! Thank you once again to Karen Williams for pulling this ornament exchange together. Carrie Johnson Mahalo Nui Loa, for gifting me such a wonderful ornament and all the goodies you sent with it, Mele Kalikimaka and Hau'oli Makahiki Hou, my friend. 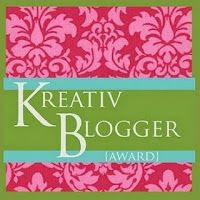 Thank you to all that stop by, please leave a comment I love hearing from y'all. 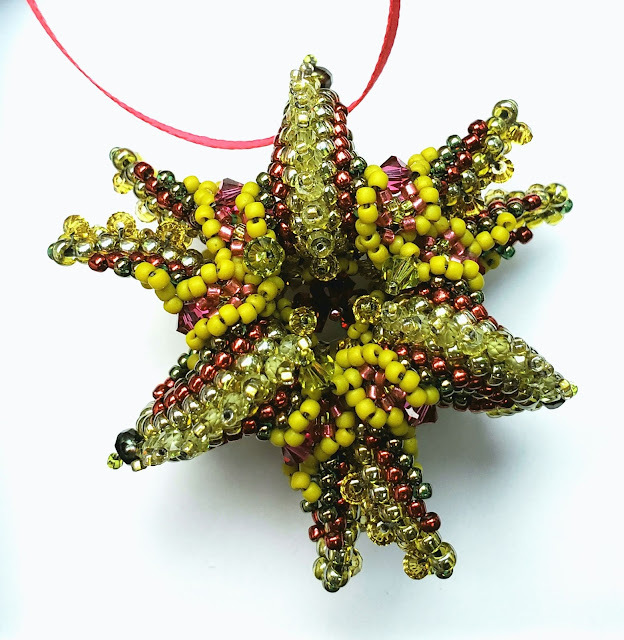 Now go by and see any updates that the others in the Holiday Ornament Exchange may have left on their blog. 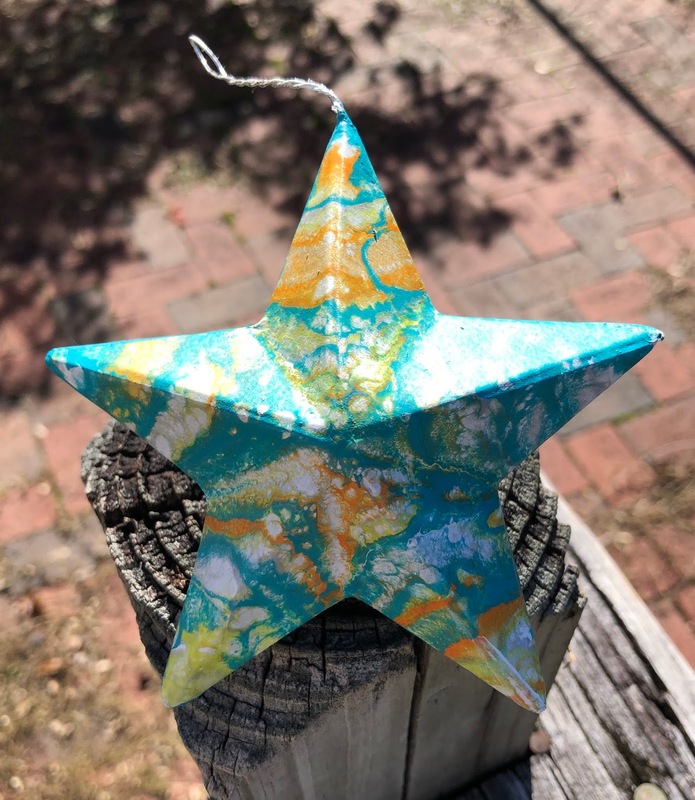 It's time for the Holiday Ornament Exchange hosted by Karen Williams. 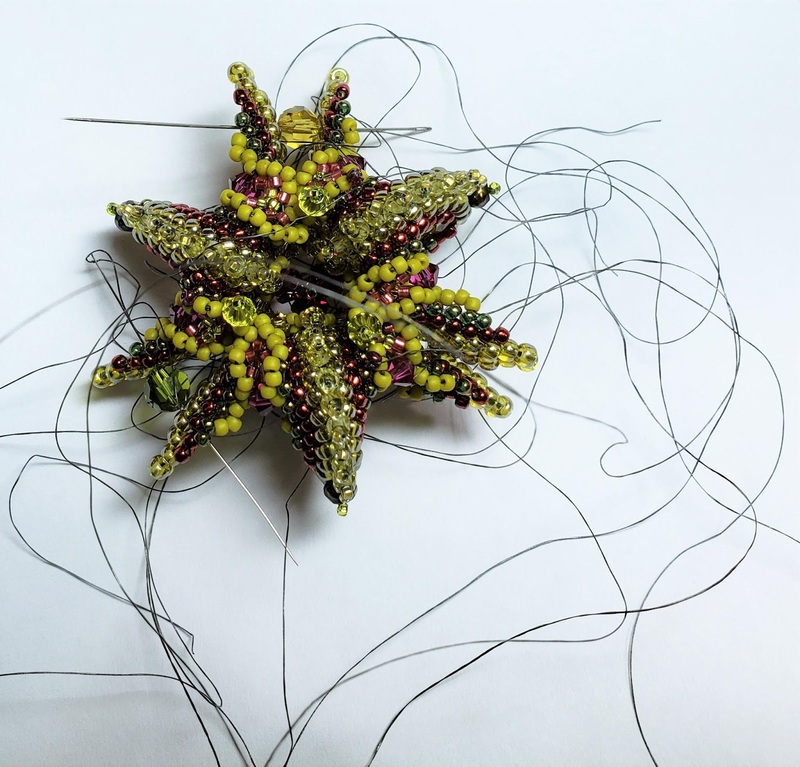 My exchange partner is Carrie Johnson a fellow off loom bead weaver. Sadly for reasons beyond our control my package from Carrie will not be delivered to me until Monday December 17th, so I will update with what Carrie sent to me later this week. I am very excited to receive my package, but I will not be able to open it until Wednesday evening, because I am going out of town to help train a new Police Communications Officer in Tuscaloosa, AL and will not be home until Wednesday afternoon. Oh well such as life. 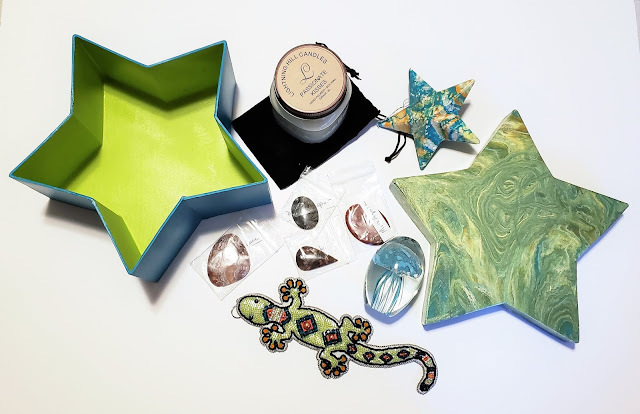 I did take photos of some of the items I sent to Carrie. I was excited to do something for Carrie in a beading form that she does not do, bead embroidery. We exchanged emails telling each other a little about ourselves, likes, dislikes, hobbies, things we collect, favorite colors, and so on. 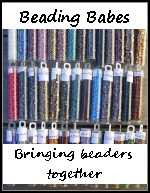 I was intrigued and intimidated at the same time as I read Carries email, she has lived a very full and exciting life, she has even taught beading classes at the Bead and Button show. So as soon as I was done reading her email I knew exactly what I was going to do for her. 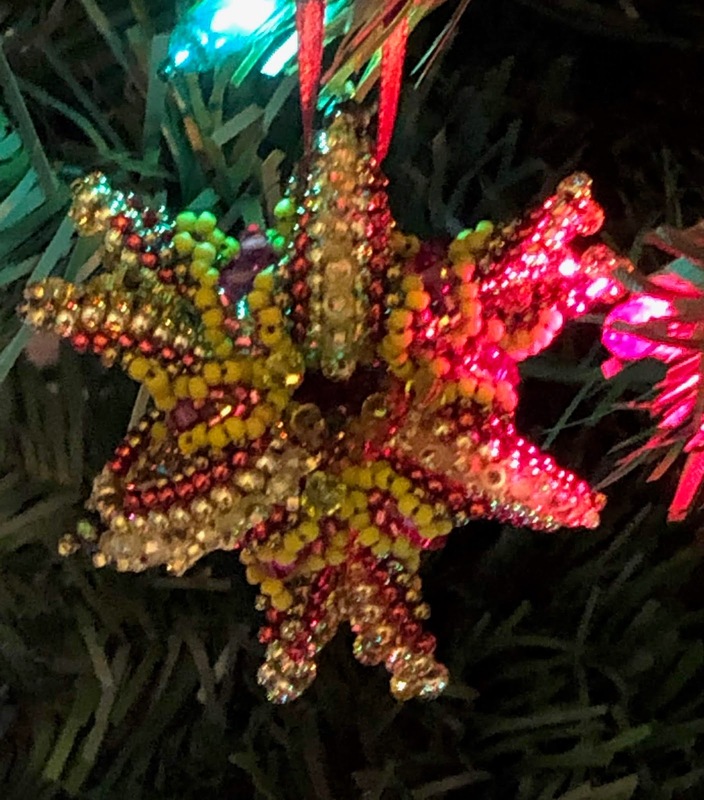 Since she lives in Hawaii I knew the traditional ornament would not do and I have a feeling Carrie is not the traditional type. So I got to work gathering the materials and colors I was going to use in her ornament. Carrie's favorite colors are teal, orange, and lime green I found everything I needed in my stash. Then I went to Pinterest to do some research on lizards, yes that's right lizards! Carrie is fond of lizards and the house lizard is very common where she lives in Hawaii. So without further ado here is Carrie's ornament. I happened to find a lizard outline so I traced the outline onto the bead backing and got to sewing. I used a piece of wire for the tongue that is also the hanger for the tree. The colors are brighter than it shows here the sun was just a little to bright when I took the photo. 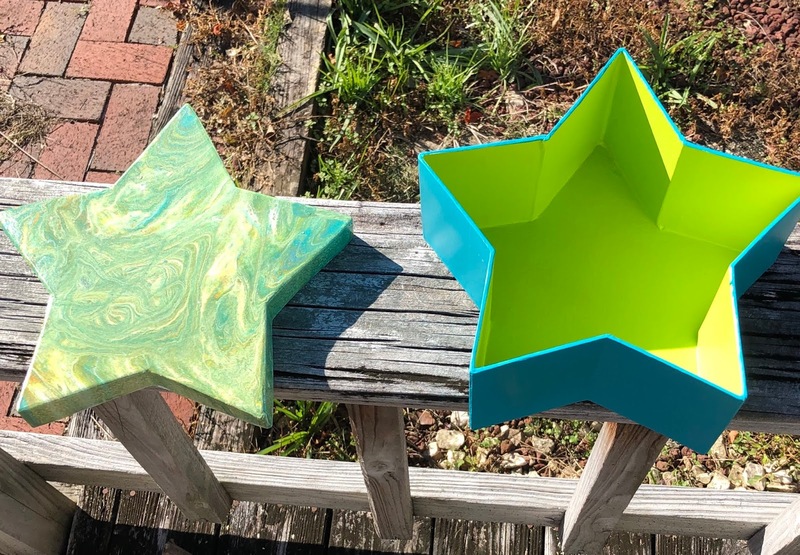 I also painted a box and a paper mache star ornament. for the lid I did the fluid paint technique and the bottom I painted the outside teal and the inside lime green. I did the same fluid paint technique on the star although the colors are more bright and not as muddy as the lid of the box. I put a few more items in the box. Carrie had told me that she was not going to open her box until I got mine and we would open them up sort of together, but since I am not getting mine until after the reveal, I wrote to her and told her to go ahead and open her box, so I hope that she opened her box and likes what is inside. Thank you Karen for inviting me to participate in the Holiday Ornament Exchange. I had a lot of fun getting to know Carrie and creating her ornament. I have put up my tree and the ornament you made for me the year we were partners in Sally Russick 2014 Holiday Ornament Swap/Hop is positioned where I can see it from where I sit and bead. 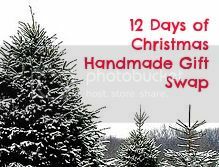 Thank you to all that have stopped by please leave a comment and then go on to see all the other participants in this Holiday Ornament Exchange. Be sure to come back later this week to see what Carrie sent to me. Happy Holidays to all of you and may 2019 be better than 2018! Well it's almost Thanksgiving and my vacation ends today. I go back to work after being off since the first of November. I have enjoyed every day of being off and being able to sleep in later than 4:15 am. In hindsight I should have waited and taken off from the second week in November and that way I could have been off until the 1st of December, but that is okay I will be back to work on Wednesday, Thanksgiving, Black Friday, Saturday and Sunday, so some of my co-workers can be off for the Thanksgiving holiday and weekend. Back around October 21st I received an invitation from Karen Williams to join the Holiday Ornament Exchange Blog Hop, so of course I signed up for the hop. On November 2nd I received the email with my exchange partner. I was paired up with the wonderfully talented Carrie Johnson. 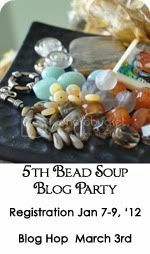 We have exchanged emails with our bios of who we are, our beading styles, and our likes and dislikes. 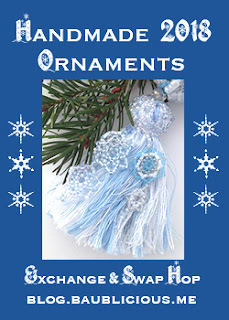 After reading Carrie's bio email I got started with thinking and designing the ornament that I am going to send to her. Y'all it is not your typical Christmas ornament, but I have a feeling that Carrie is going to be very pleased with her ornament. So come on back on December 16th and see what I sent to Carrie and what I received from Carrie. Happy Thanksgiving and if you are traveling be safe. 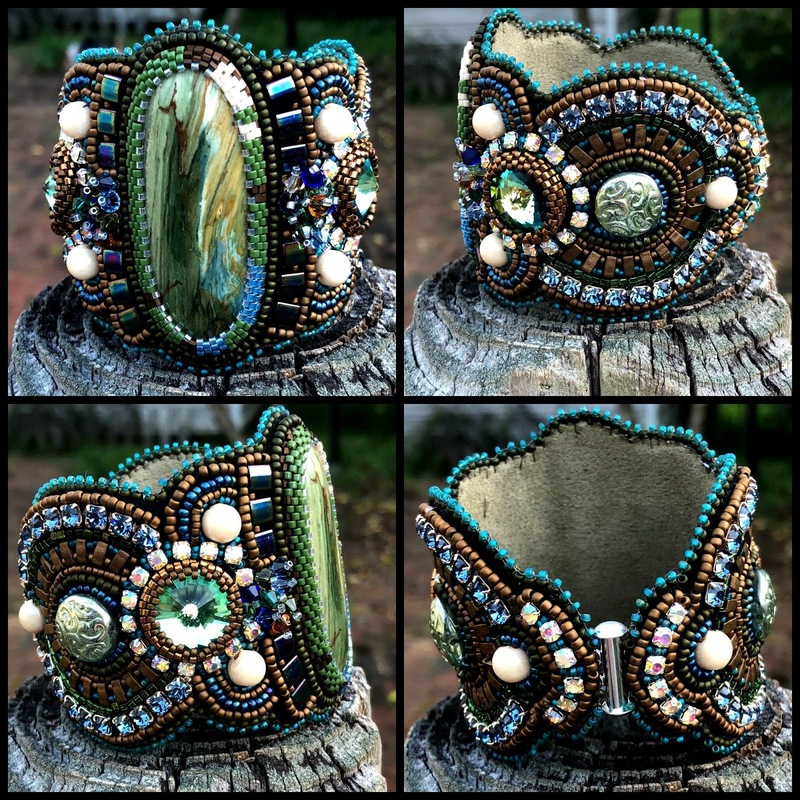 So on Facebook I had seen this gorgeous bracelet that Deborah McDonald had made and I fell in love with the design. I found out that the design was called Mountain Girl Bracelet by Regina Payne and that I could get the tutorial from her website http://www.nightowlstudiojewels.com. The tutorial can be obtained by giving a donation to the Puerto Rico hurricane relief fund. So I got the tutorial and in February of this year I made my first Mountain Girl Bracelet. The focal stone is a cabochon that I made Gary Green - Larsonite Jasper. After finishing the first one I couldn't wait to make another one, but I did not have another narrow oval cab, so I chose a large round oval cab of Orbital Jasper. In April 2018 I had two MGB's made. In July 2018 I made my third MGB this one is a gift to my cousin Sarah. Two years before at a family reunion I asked my Aunt and Uncle and their two daughters to pick out a cabochon each and that I would make them something with the cab they chose. Well I would take those cabs out and play with them, but they just would not speak to me until just before the family reunion in July of this year. 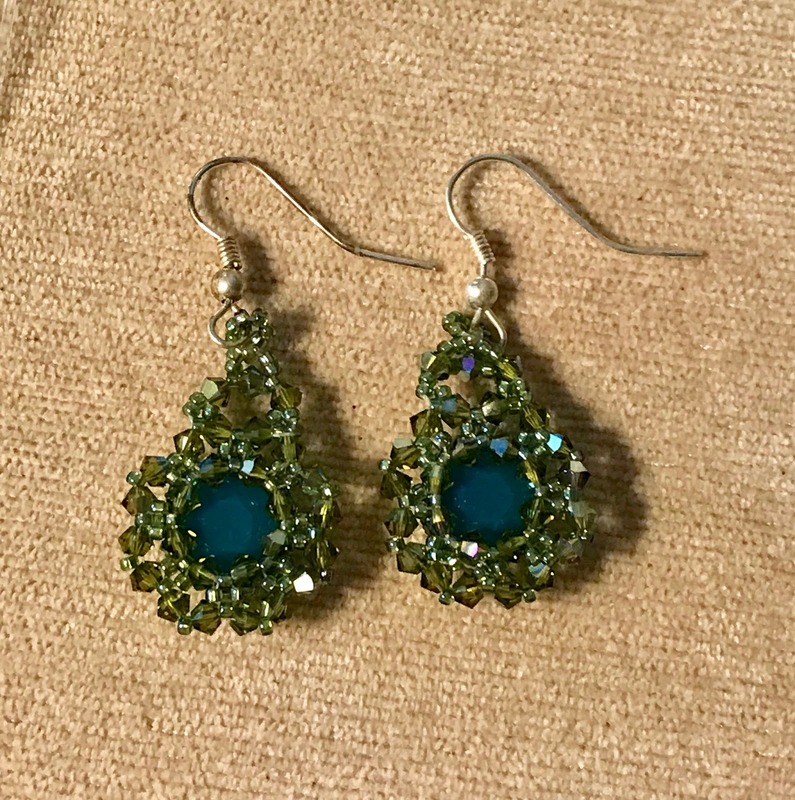 The first square is a Mexican Crazy Lace cab that my Aunt Betsy chose I did a simple pendant and beaded a Chenille Stitch rope. The second square is a purple Florite cab that my cousin Amy chose I wire wrapped it with silver square wire. the third and forth square is a Bolo Tie and made for my Uncle David he chose a Stony Creek Jasper cab. Last but not least the MGB I made for my cousin Sarah she chose a Red Moss Agate cab. Monutain Girl Bracelet # 4 The focal cab is a polymer clay cabochon created by Sherri Kellberg, click on her name for her Etsy shop. 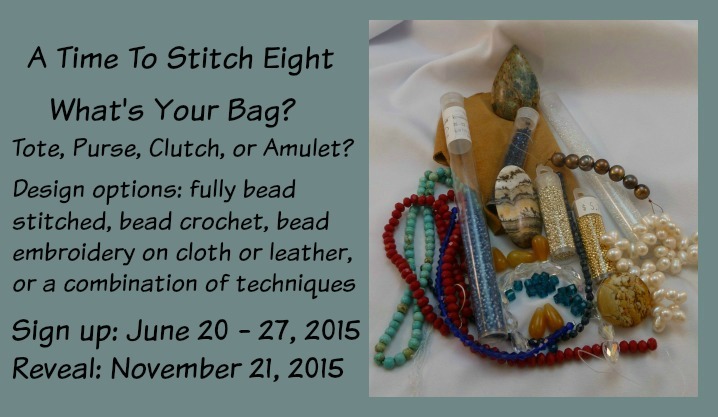 Regina provides everything you need to make a MGB except for the thread and needles. So as you can tell I'm totally addicted to making these bracelets, on to MGB #5. I made this one in August also. I made the cabochon especially for this MGB. I cut and cabbed an Amethyst Sage Jasper. This MGB was a birthday gift for my future daughter-in-law Samantha. This last MGB is a birthday gift for my Birthday Buddy for Life Phyllis. We were both born in November me on the 16th and her on the 18th and we made a pact that no matter where we are in November that we would get together for our birthdays. 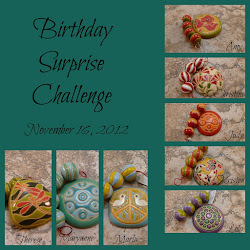 This MGB is made with another one of Sherri Kellberg's polymer clay cabs. I made this one in October 2018. Mountain Girl Bracelet # 6 This one is so bright, colorful, and cheerful just like Phyllis. I'm not done making these MGB's I have five more lined up to make. There is a Facebook group just for the Mountain Girl Bracelets, it is called Mountain Girl Bracelets and Kits. Thank you for stopping by, please leave a comment I love hearing from you. I can't believe the last time I was on my blog was May 1, 2017. Wow I had no idea it had been that long, well I just want to let y'all know I'm still around. So let me tell you a little that has been going on in my life since May 1, 2017. I have moved around a couple of times, still in Montgomery, AL though. I have mostly been on Facebook it's easier to connect with people there, but I have missed blogging. I will be retiring from my job with 25 year on July 1, 2019 and I can hardly wait. 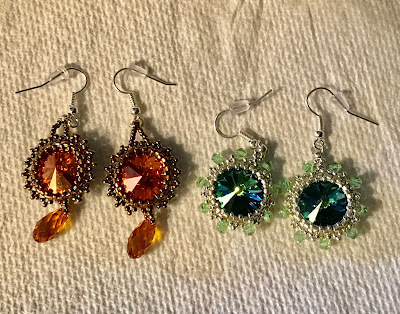 My plans are to open an on line store to start selling my jewelry, I will now have the time to organize and keep it up to date. I'm also planing on doing the art festival circuit as many as I can get in on. I want to teach and take classes in learning more about silversmithing. 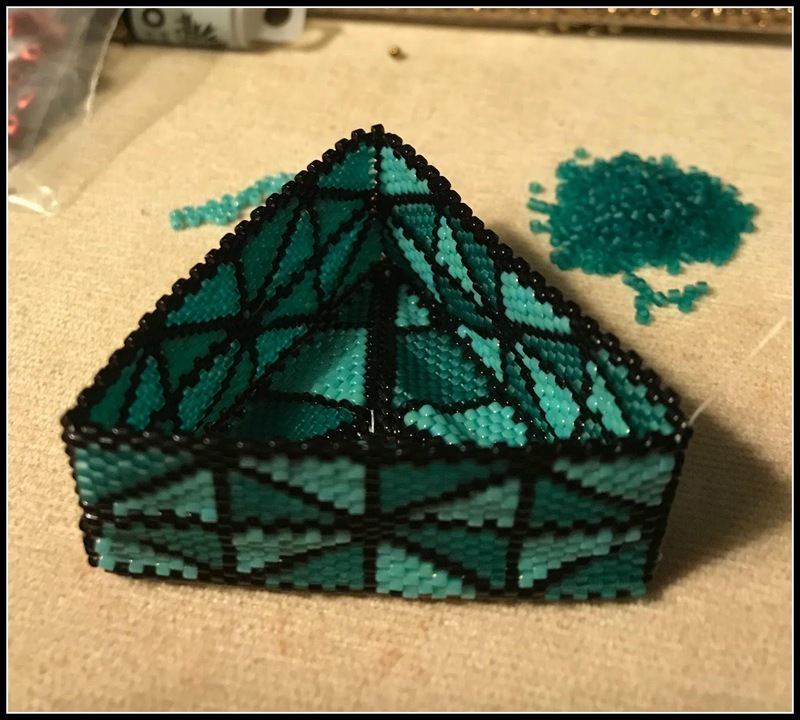 I've been doing a lot of beading it's the one thing that helps release the tension of the day and keeps me sane. Here are some of the items I have been creating. 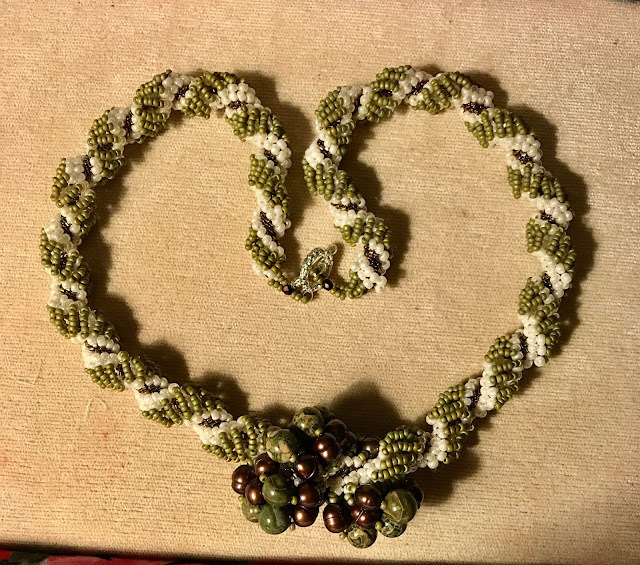 Dutch spiral necklace made with ivory and olive green AB size 11/O seed beads the focal is bronze colored freshwater pearls and African Brecciated Jasper round beads. 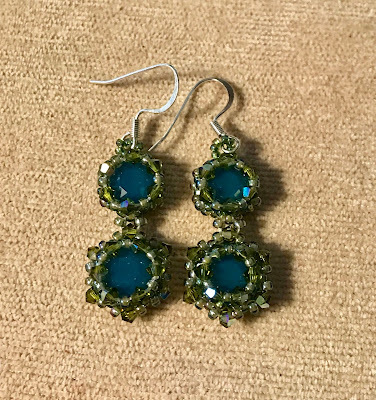 A Jill Wiseman earring design. 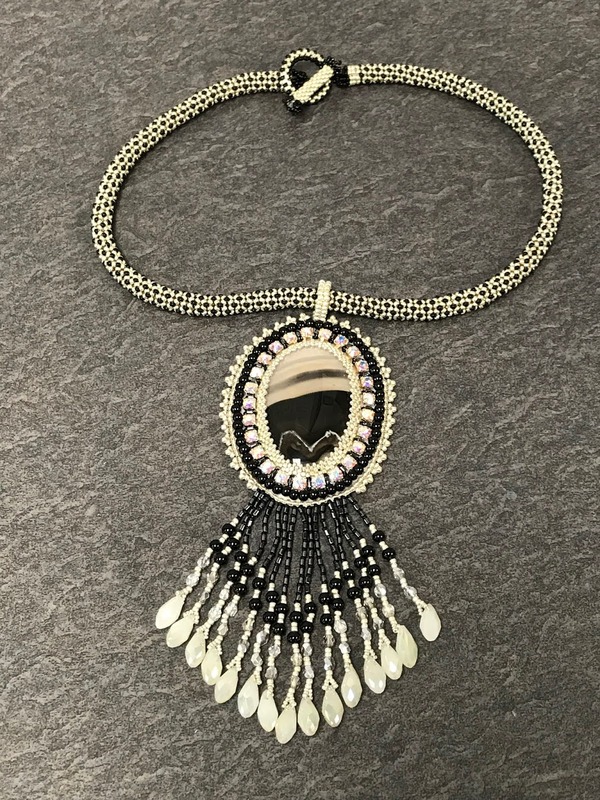 Bead embroidery pendant featuring a Agate cabochon and a Chenille stitched rope. Well that's all for this blog post. I hope all is well with all of my blog friends. Wow I can not believe how time flies it is May 1st already. This reveal sneaked up on me, Well to tell the truth I forgot about the reveal date until I received the reminder email from Karen Williams, of Baublicious blog, that put me in a rush to try to get my UFO finished, Well you know what they say about best laid plans... You guessed it I did not get my UFO finished. I will show you a picture of how far I got though and a promise to have it done by the next UFO reveal. Before I show you my UFO let me recap on The Unfinished Objects Studio Support Group. 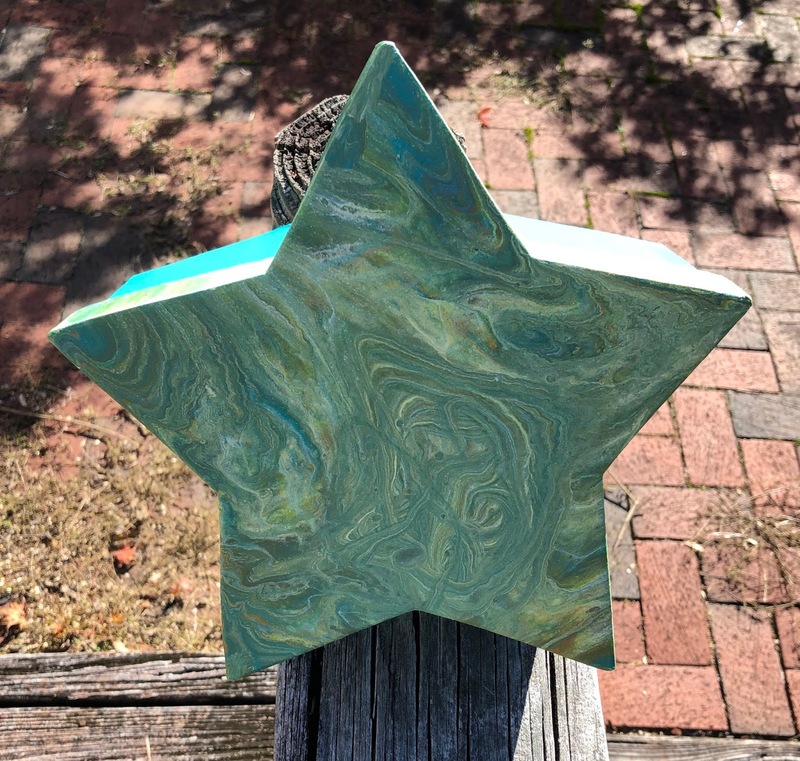 Karen Williams asked her newsletter readers if we had unfinished objects of any sort, that we look at and say to ourselves how much we should get them finished. A lot of us responded with a yes we do have unfinished projects that we would like to get finished. So Karen put together a support group on Facebook for those of us that have UFOs so we can have a forum where we can show our finished objects or to ask questions to others in the group. She also asked those of us with blogs if we would like to do reveal dates and of course we agreed to reveal dates, because it was just the incentive to get the UFO's done. This is our 2nd reveal and this time it is not just the blog group but also the facebook group that will be revealing on today. Here is a picture of my UFO before I started to get it finished. I stuck everything in a baggie and put it in my I am going to finish this one day box. I had gotten the base of the box finished and started on the sides of the box. Here is how far I got with the box. I finished the sides now all I have to do is the lid. I have not decided if I want to put feet on the box or not, you will just have to wait for the next reveal date to find out what I decided. Thank you Karen for bring us procraftinators together into a support group, so that we may over come our procraftination and get our UFO's done. I need to work a little harder at over coming my procratination. 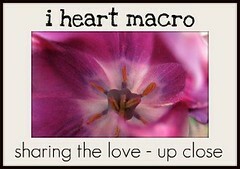 Thank you to all that have stopped by my blog. I appreciate your visit. 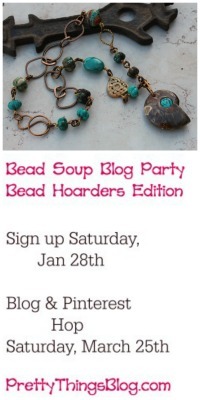 Now please go and visit the others in this blog hop, hopefully they will have completed their UFO's. Hello, my name is Therese and I live in the great state of Alabama. 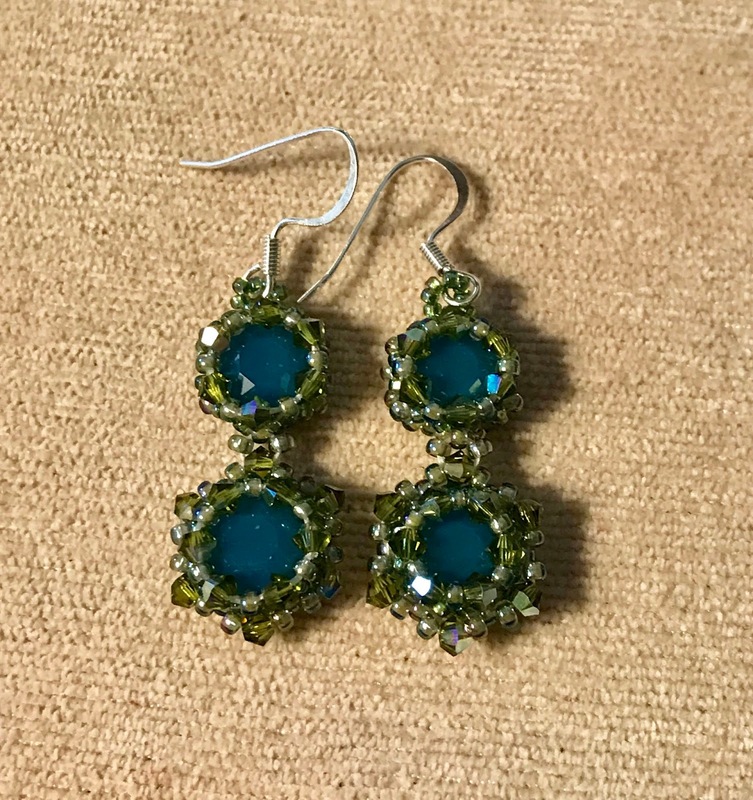 I love to make jewelry in my spare time. 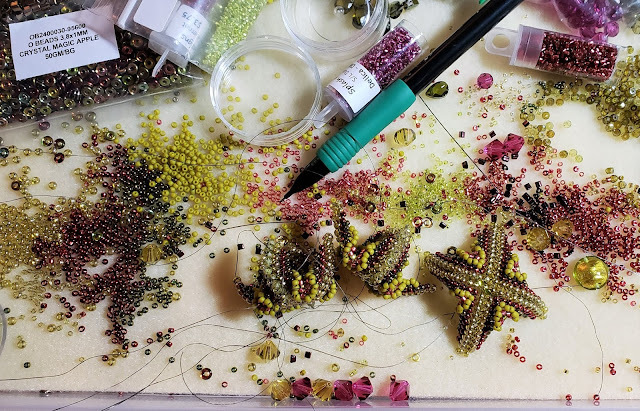 I started making jewelry in 2005. I was looking through a beading magazine and saw a necklace that I fell in love with and just had to make, so I did, and I have been hooked ever since. 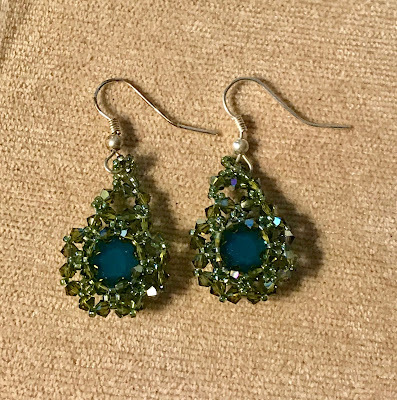 Along with jewelry making I crochet, paint mostly on glass items, make clothes, quilt, counted cross stitch, and a few other crafts. I'm a mother of one, a handsome young man that is all grown up and on his own. Happy New Year! - We would like to wish everyone a Wonderful and Happy New Year! Copper Diem: Daily Earrings 4-7 Day 97 - Copper Diem: Daily Earrings 4-7 Day 97 Love these! 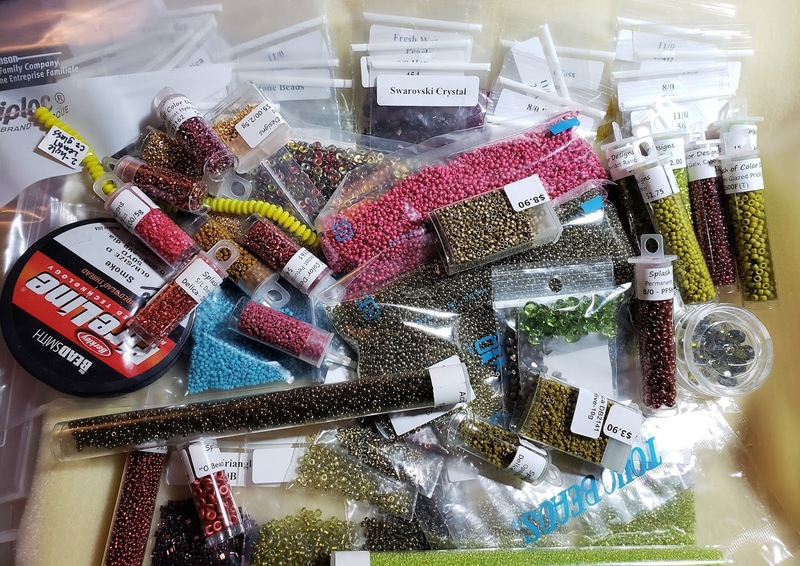 The beads are awesome!! !